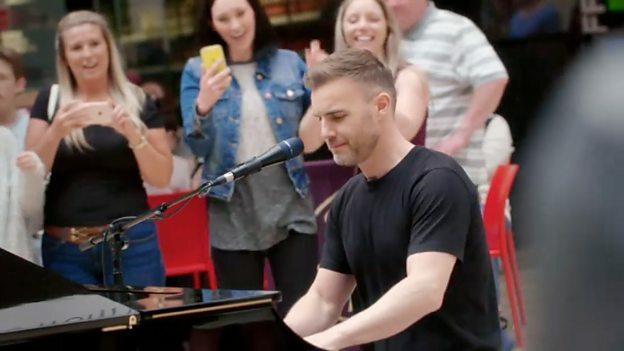 BBC One today confirms its brand new Saturday night entertainment show Let It Shine in conjunction with Gary Barlow and presented by Graham Norton and Mel Giedroyc. Let It Shine will be seeking out talent to create a band who will join the cast of a brand new stage show featuring the music of Take That, created in association with Gary Barlow, Mark Owen and Howard Donald. Over eight weeks of competition, BBC One and Gary Barlow will be looking for talented individuals to form a new group that exudes the charisma, showmanship and stage presence that the hit group has become so famous for. Gary will be joined by three mentors each week on Let It Shine to find the very best talent the country has to offer. The winning group will perform the hits of the band in a nationwide musical stage show called The Band. The ambitious format will place the spectacle of the group's live concert experience at its heart and feature all-singing and all-dancing performances, unearthing performers from every corner of the United Kingdom. Graham Norton and Mel Giedroyc will co-host the talent search. The series is commissioned by Charlotte Moore, BBC Controller of TV Channels and iPlayer, alongside Alan Tyler, Acting Controller of BBC Entertainment Commissioning, and Rachel Ashdown, Commissioning Editor for BBC Entertainment. Alan Tyler says: "Bringing together the crown jewels of entertainment talent, in a show that is original, fun and distinctive, all to a soundtrack that a large part of Britain grew up with, promises to deliver a real treat for audiences on a Saturday night." Let It Shine is a BBC Studios Entertainment Production, overseen by Guy Freeman, Editor of Formats and Special Events (Diamond Jubilee Concert, Children In Need Rocks, Adele At The BBC) and Executive Producer Andrew Cartmell (Sport Relief: Clash Of The Titans, Strictly Come Dancing: It Takes Two).